Very Cameron Diaz. Not my cup of coffee. Fabulous look without trying too hard. She’s very pretty and has an enviable figure, but that is a horrible outfit. It’s like a model collided with a tourist. I like her style and it’s hard to pull off all of these very different pieces into a cohesive look. She looks great in this combination, the sunnies, the shorts and the heels. Yes, it’s very Cameron Diaz and this woman pulls it off. It suits her elongated figure. Coming from Chicago, which has decidedly entered the next season, I can’t help but be envious of still being able to wear bare legs!! Thank goodness she does not have one of those huge handbags with buckles and belts and the whole enchillada stuck to it,that shout and cry for attention.Now days first you see the huge handbags and then the person holding or hanging on to it.it’s all about the right proportion, i do not think that the bag she has under her arm is.Still she does have guts to walk the macadam that way.Aha,but when one is young and beautiful as she is…one can get away with it!! She’s sorta cute but I don’t see anything remarkable about the outfit. I think we are going to be seeing lots of those little shorts cut straight like that next srping/summer, it looks to me like she got her ideas from the recent Dsquared shows where you see that look for both guys and girls. I am not sure if I like it or not. Very nice legs, but this outfit crosses the line into bad taste. The blonde hair, the trucker skull hat, the denim cut-offs (?!? ), and the obvious footwear choice don’t add up. This blog features male traditional looks; I wish there were more female trad looks to enjoy in addition to the trendy looks! She’s a beautiful girl, but this would look terrible on anyone else. I hate this style of dressing, it’s too close to Britney Spears for comfort! In short, not something I could look good in or would try to pull off. I do like the shoes, but not with the outfit. She is quite brave to wear short shorts and tall wedges in NY, but most likely she lives in a “safe” part of town (i.e., one where she wouldn’t get followed for wearing this– it happens). To me this looks so LA (ok aside from the name on the shirt). Especially because it has definitely NOT been warm here for the last few days. Maybe sweater weather, sans jacket, but certainly not warm enough for little shorts. Maybe I just hate to be cold, and maybe I’m just excited about rocking my fall clothes… but to me, seasonally inappropriate clothes can either look offhandedly chic or just plain odd. I’ll vote for the latter for this. Cameron Diaz was never this cute and never had a figure like this. It’s a cute way to do casual and trendy. And it flatters her figure. the outfit in itself is awful. she looks good simply because she’s gorgeous. she could get away with anything. she also looks quite selfconfident. Los Angeles is overflowing with these girls in this outfit. This look demands the kind of physical perfection very few real women have – if you don’t have this girl’s face and figure you’d look sloppy; not the least bit arresting. 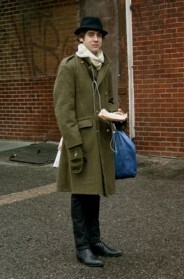 Even when the clothes are casual, the Sartorialist’s camera is always pointed at something chic. To me, this is not a style shot – it’s a beauty shot. meh. she’s clearly hot – what a great figure – but this outfit leaves me cold. i think it’s the idea of heels with such a casual look. i give her two thumbs down. This does not belong on your site. So NOT classy or even stylish in anyway. this might be a dumb question but “jeter” as in derek, right? “70″ as in…wha?? or is there another famous sports figure somewhere named jeter with the number 70? Am I missing the reason a picture was taken of her? Clearly she looks amazing no matter what she wears. Outfit-wise I find the tomboy-ish look and high heels a little bit contrived and not as likeable as if she was wearing an old beat-up pair of converse. There is a thin line between outfits that look thoughtful/mulled-over and outfits that look contrived/calculated, I feel, and for me this one is too much the latter. Wow. She is amazing. I love her shorts (and legs). I’m a size 2 or 4. Sart, please post more stylish people that are not size 0. The shoes are such an unexpected twist here. Not saying this style of shoe is rare or quirky in general, just with this particular oufit. Her body type is clue here. This would not be easy on the average woman, maybe being that skinny is really her consciencious expresion. Yall are crazy. I think this is a great casual look. Maybe not season appropriate, but still a fun outfit. Although I’m not a huge fan of what she’s wearing, the first word that came to my mind was “fresh.” I like that she isn’t following the now stale trend of tunic and leggings in subdued tones; I like the punches of color and the way she exudes with the spirit of youth in the way she openly experiments with different elements (like the gold wrist cuff paired with a baseball tee and high wedges). Different, fresh, young, great. I love the vintage t-shirt…but the hat and the shoes are awful!!! Eh I wouldnt wear it myself, but I like the shoes…and she has a gorgeous figure. Damn, if only i had those legs! look, it’s paris, but with better shoes. her bod rocks. i love everything on the outfit except the tee. it’s kinda high-school-ish. Disagree with anonymous – she’s trying VERY hard. The skull and cross bones hat, the football jersey, etc. etc. All very cliched and outre. However, that does not mean 90% of the male population would find her very attractive! Hot is right! I’m a straight woman and I can’t take my eyes off of her. Wish I had her looks – those mile-long legs! This is trying too hard. Casual with heels immediately qualifies as trying (which, of course, I can be a great thing), the skull hat makes it trying too hard. Gorgeous. I see nothing bad here. Just a pretty girl with her own unique style. It works, and its hers. Wonderful one! I like her hat and tshirt. And I did not like her bottom because of her thin legs. But general seems is nice..